OUTDATED. See the current data at https://data.cityofchicago.org/d/64xf-pyvh -- The Illinois Enterprise Zone Program is designed to stimulate economic growth and neighborhood revitalization in economically depressed areas of the state. For more information about this program, go to http://www.commerce.state.il.us/dceo/Bureaus/Business_Development/Tax+Assistance/Enterprise-Zone.htm. The data can be viewed on the Chicago Data Portal with a web browser. However, to view or use the files outside of a web browser, you will need to use compression software and special GIS software, such as ESRI ArcGIS (shapefile) or Google Earth (KML or KMZ). OUTDATED. See the current data at https://data.cityofchicago.org/d/fwns-qqic -- To view or use these files, special GIS software such as Google Earth is required. To download, right-click the "Download" link above and choose "Save link as." 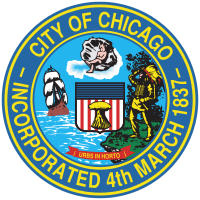 This version of the data was posted 8/8/2012 and stayed live until 7/16/2015, when it was replaced with the list of aldermen inaugurated 5/18/2015, after allowing time for most office space arrangements to be finalized. OUTDATED. See the current data at https://data.cityofchicago.org/d/fz5x-7zak -- Tax Increment Financing (TIF) district boundaries in Chicago. The data can be viewed on the Chicago Data Portal with a web browser. However, to view or use the files outside of a web browser, you will need to use compression software and special GIS software, such as ESRI ArcGIS (shapefile) or Google Earth (KML or KMZ), is required. Locations of educational units in the Chicago Public School District for school year 2007-2008. To view or use these shapefiles, compression software, such as 7-Zip, and special GIS software, such as Google Earth, are required. Attendance boundaries for elementary schools in the Chicago Public Schools district for school year 2010-2011. Generally, all students in the applicable elementary school grades who live within one of these boundaries may attend the school. To view or use these shapefiles, compression software, such as 7-Zip, and special GIS software, such as Google Earth or ArcGIS, are required. Locations of educational units in the Chicago Public School District for school year 2009-2010. To view or use these shapefiles, compression software, such as 7-Zip, and special GIS software, such as Google Earth, are required. Attendance boundaries for middle schools in the Chicago Public Schools district for school year 2011-2012. Note: only 29 middle schools have attendance boundaries in school year 2011-2012. Middle school boundaries are often established to relieve overcrowding at nearby elementary schools. Generally, all students in the applicable middle school grades who live within one of these boundaries may attend the school. To view or use these shapefiles, compression software, such as 7-Zip, and special GIS software, such as Google Earth or ArcGIS, are required. Attendance boundaries for high schools in the Chicago Public Schools district for school year 2010-2011. Generally, all students in the applicable high school grades who live within one of these boundaries may attend the school. To view or use these shapefiles, compression software, such as 7-Zip, and special GIS software, such as Google Earth or ArcGIS, are required. Locations of educational units in the Chicago Public School District for school year 2012-2013. To view or use these shapefiles, compression software, such as 7-Zip, and special GIS software, such as Google Earth, are required. Attendance boundaries for middle schools in the Chicago Public Schools district for school year 2009-2010. Note: only 33 middle schools have attendance boundaries in school year 2009-2010. Middle school boundaries are often established to relieve overcrowding at nearby elementary schools. Generally, all students in the applicable middle school grades who live within one of these boundaries may attend the school. To view or use these shapefiles, compression software, such as 7-Zip, and special GIS software, such as Google Earth or ArcGIS, are required. Attendance boundaries for elementary schools in the Chicago Public Schools district for school year 2008-2009. Generally, all students in the applicable elementary school grades who live within one of these boundaries may attend the school. To view or use these shapefiles, compression software, such as 7-Zip, and special GIS software, such as Google Earth or ArcGIS, are required. Attendance boundaries for middle schools in the Chicago Public Schools district for school year 2014-2015. Note: only 23 middle schools have attendance boundaries in school year 2014-2015. Middle school boundaries are often established to relieve overcrowding at nearby elementary schools. Generally, all students in the applicable middle school grades who live within one of these boundaries may attend the school. To view or use these shapefiles, compression software, such as 7-Zip, and special GIS software, such as Google Earth or ArcGIS, are required. Preference boundaries for selected charter schools in the Chicago Public Schools district for school year 2017-2018. As opposed to elementary or high school attendance boundaries wherein each residing student is entitled to attend, charter boundaries simply serve as a guide for charter school administrators to use during the application/lottery process. Applicants residing within a specific boundary are generally given preference over applicants residing outside of the boundary. To view or use these shapefiles, compression software, such as 7-Zip, and special GIS software, such as Google Earth or ArcGIS, are required. Attendance boundaries for high schools in the Chicago Public Schools district for school year 2006-2007. Generally, all students in the applicable high school grades who live within one of these boundaries may attend the school. To view or use these shapefiles, compression software, such as 7-Zip, and special GIS software, such as Google Earth or ArcGIS, are required. Attendance boundaries for middle schools in the Chicago Public Schools district for school year 2008-2009. Note: only 32 middle schools have attendance boundaries in school year 2008-2009. Middle school boundaries are often established to relieve overcrowding at nearby elementary schools. Generally, all students in the applicable middle school grades who live within one of these boundaries may attend the school. To view or use these shapefiles, compression software, such as 7-Zip, and special GIS software, such as Google Earth or ArcGIS, are required. Attendance boundaries for middle schools in the Chicago Public Schools district for school year 2006-2007. Note: only 43 middle schools have attendance boundaries in school year 2006-2007. Middle school boundaries are often established to relieve overcrowding at nearby elementary schools. Generally, all students in the applicable middle school grades who live within one of these boundaries may attend the school. To view or use these shapefiles, compression software, such as 7-Zip, and special GIS software, such as Google Earth or ArcGIS, are required. Attendance boundaries for middle schools in the Chicago Public Schools district for school year 2007-2008. Note: only 34 middle schools have attendance boundaries in school year 2007-2008. Middle school boundaries are often established to relieve overcrowding at nearby elementary schools. Generally, all students in the applicable middle school grades who live within one of these boundaries may attend the school. To view or use these shapefiles, compression software, such as 7-Zip, and special GIS software, such as Google Earth or ArcGIS, are required. Locations of educational units in the Chicago Public School District for school year 2008-2009. To view or use these shapefiles, compression software, such as 7-Zip, and special GIS software, such as Google Earth, are required.